The world population is projected to increase drastically in the coming decades which might bring about shortage of food. It is therefore necessary to properly manage resources and to put more effort in the food production sectors. Among the different sources of animal protein, freshwater fish is considered as one of the most promising commodities that can contribute in increasing food production. 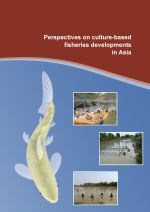 Moreover, small-scale aquaculture which is common in the Asia-Pacific region, provides diverse benefits to rural farmers including income generation, nutrition improvement, and sustainable aquaculture practices through integrated farming system. 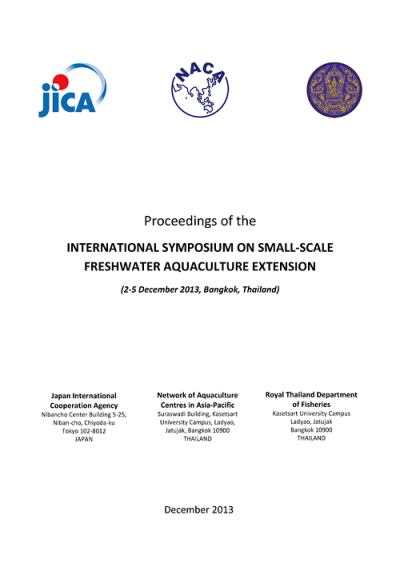 The Japan International Cooperation Agency (JICA) has been involved in the development of small-scale aquaculture through technical cooperation projects (TCPs) in Southeast Asia and Sub-Saharan Africa, which evidently demonstrate the effectiveness of “farmer-to-farmer extension” approach among rural aquafarmers. In these TCPs, core-farmers who produce fingerlings are motivated to teach grow-out farmers simple aquaculture techniques so that they can acquire patronage of clients and expand market outlets among fish farmers. It is noteworthy that such system not only provides economic benefit to the core-farmers but also enhance their social role as local leaders and/or extension workers. This approach is not totally new especially in the agriculture sector, thus the experiences, lessons learned and findings from these TCPs on small-scale aquaculture are worth sharing to other stakeholders, as reference for good management practices. In this context, this international symposium was organized for stakeholders involved in the JICA-assisted projects in Cambodia, Lao PDR, Myanmar, Benin and Madagascar. The symposium was also attended by representatives from other countries in the region including Cote d’ Ivoire, Indonesia, Malaysia, Nepal, Philippines and Zambia. JICA, NACA and DOF-Thailand co-organized this symposium, with support from key partner institutions including Food and Agriculture Organization of the United Nation – Regional Office for Asia and the Pacific (FAO-RAP), Southeast Asian Fisheries Development Center (SEAFDEC), Thailand International Cooperation Agency (TICA) and Asian Institute of Technology (AIT). A complete list of participants is presented in Annex B. The main objective of this symposium is to provide a venue for information sharing on extension of small-scale aquaculture, specifically targeted to those individuals and relevant organizations involved in various aquaculture development projects. The symposium will also assess and present the effectiveness of “farmer-to-farmer extension” approach in the implementation of relevant aquaculture development projects in the region.